Police have confiscated the 2013 maroon Acura MDX SUV. Police are reaching out to the public for any surveillance footage of a vehicle in connection with a missing child case in Richardson. It's been six days since 3-year-old Sherin Mathews disappeared and many questions are left unanswered. An SUV taken from her family's home is now front and center in the investigation. According to police, the maroon 2013 Acura MDX may help explain what happened that morning when Sherin disappeared from her home in the 900 block of Sunningdale. The SUV was absent from the home Saturday between 4 a.m. and 5 a.m., after Sherin's father admitted to putting her outside, but before he called police to report her missing. Police say they hope people within a 30-minute radius can spot the vehicle in their footage. 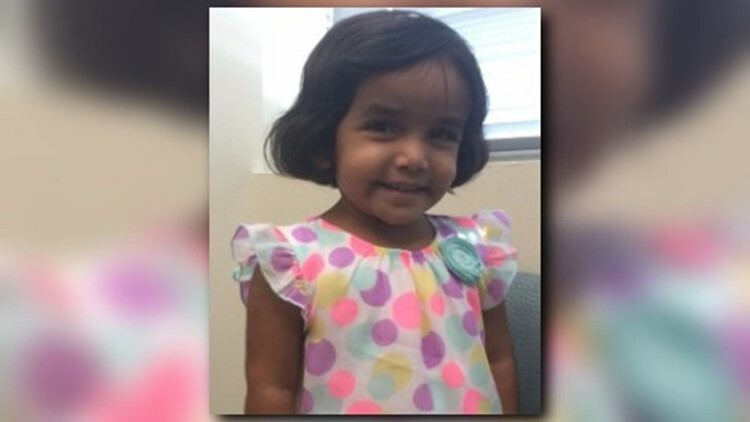 Sherin's father, Wesley Mathews, was arrested for child endangerment and has since bonded out. Sherin's mother, Sini Mathews, has not been charged with any crime. "All she wants is for her daughter to be returned," said attorney Kent Starr, who represents Sini. Wesley Mathews took his daughter outside at 3 a.m. Saturday to discipline her, the affidavit states. She was put outside in the middle of the night as punishment for not drinking milk. According to the affidavit, he told her to stand near a large tree in the backyard. When he went outside 15 minutes later, his daughter was gone. He called police five hours later.